Entries are now open for the world’s newest robotics expo and competition, with prize money of around $1 million USD or more than $100 million yen. 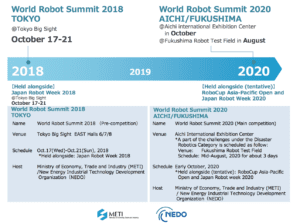 The World Robot Summit (WRS) 2018 will be held as a preliminary and qualifying event for the WRS 2020. The venue is the Tokyo Big Sight East Halls, over 5 days from Oct 17 to 21. 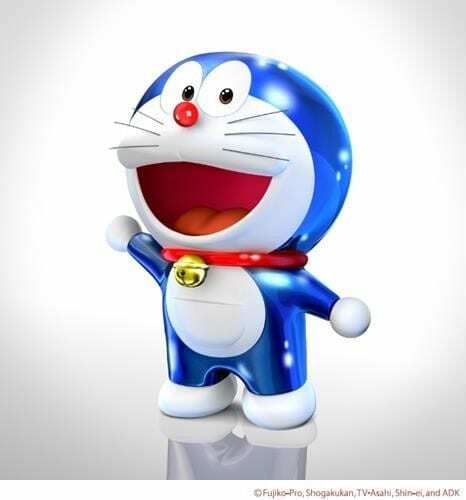 Japan has a reputation as one of the most advanced robotics nations to uphold, and the upcoming Tokyo 2020 Olympics will be shining the global spotlight on Japan. 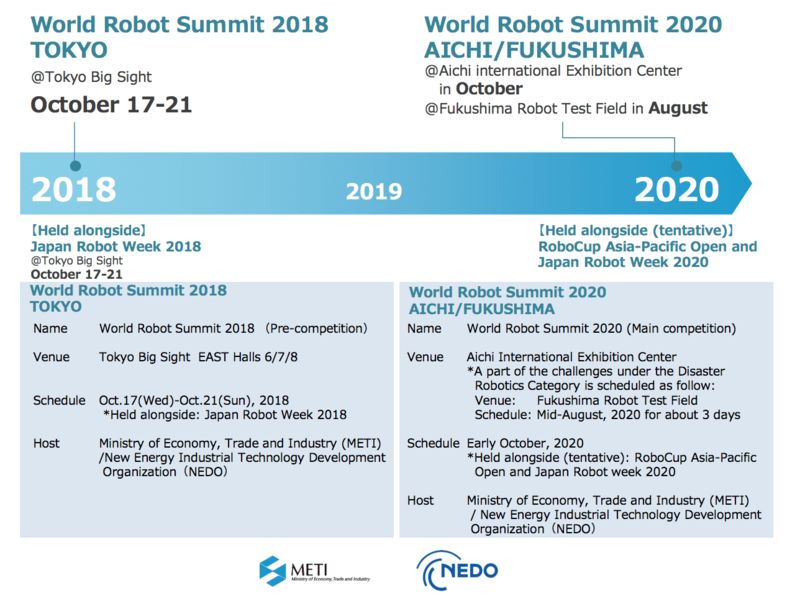 The WRS organizers, The Ministry of Economy, Trade and Industry (METI), and New Energy and Industrial Technology Development Organization (NEDO), hope to highlight the strength of Japan’s robotics and also create an opportunity to advance global robotics as a whole. Not only will top researchers come together for the 5 day period, to compete and to share knowledge, but the state of the art in many robotics areas will be on display, showcasing solutions to difficult problems and enhancing the perception and implementation of robotics in society. Competition has always been a great driver of research development, from the Longitude prizes of 16th to 18th century and the Napoleonic era food preservation challenge of 1795, to today’s DARPA Challenges, X-Prizes and RoboCup. 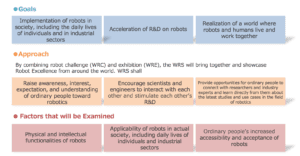 The World Robot Challenge (WRC) 2018 is the competition section of the WRS and will consist of 9 challenges in 4 categories; Industrial Robotics, Service Robotics, Disaster Robotics, and Junior. Sponsors are providing prize money exceeding $100 million yen and travel expenses might be granted to some participating teams. For more information and application visit the WRS website. The closing date for registration is March 15, 2018. 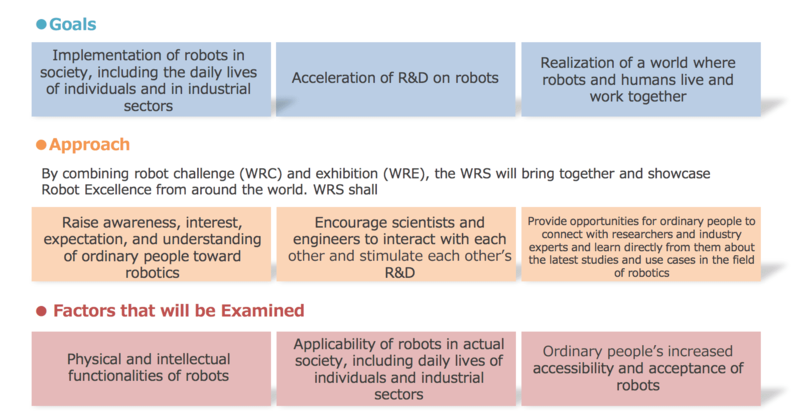 The World Robot Expo (WRE) will run in conjunction with the WRC, during Japanese Robotic Week. 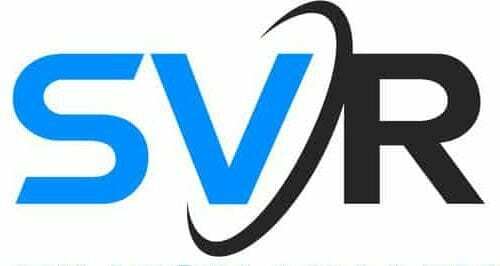 With the involvement of school teams and the concomitant public and media interest in the competitions, the expo will also be very well attended.